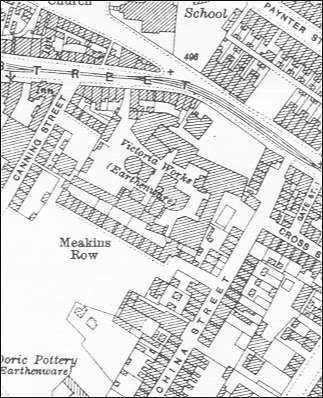 The Victoria Works were established in the High Street, Fenton, Stoke-on-Trent - in an area which used to be called Lane Delph. These works in Fenton should not be confused with the Victoria Works, Longton; the Victoria Works, Stoke; the Victoria Works, Hanley; the Victoria Pottery, Hanley or the Victoria Pottery, Tunstall. (tenants of the Revd. John Wolfe). manufacturing earthenware. Held at least between 1811 and 1843. Recorded as Ginder and Hulse 1828-1830. In 1859 the works were advertised to let. also noted as Wathen & Co in 1864. 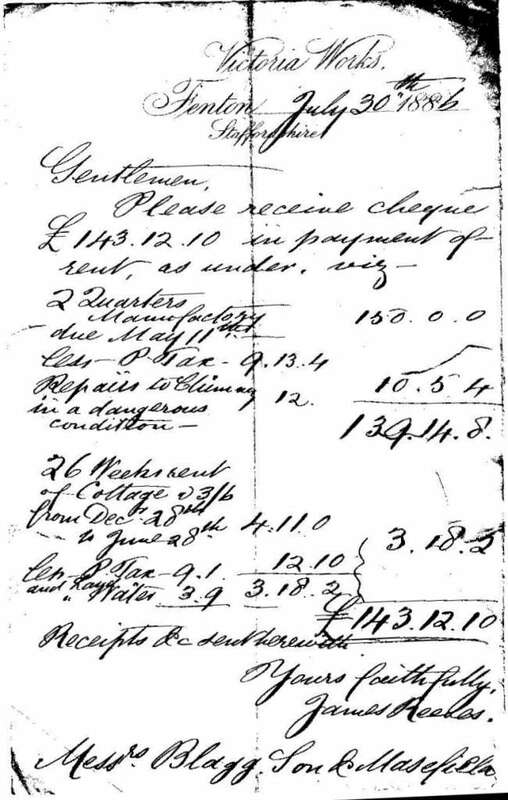 In 1886 James Reeves was paying £150 for six month rent for the Victoria Works. In the war period (1941-45) the Victoria Works were closed and the business of J Reeves was consolidated with that of G L Ashworth. After the war Reeves started business again at the works in Fenton until 1948. Some sources state that from c.1912 Cartwright & Edwards shared the Victoria Works with Reeves - however this is a mistake. Cartwright & Edwards occupied the Victoria Works in Longton, a few miles away from the Fenton factory. renamed their existing business as Victoria & Trentham Potteries Ltd.
"For many years, from about 1811 to 1843, this manufactory was carried on by S. Ginder & Co., and was then held by James Reeves (from 1870), who produced the more ordinary qualities of earthenware. This firm continued to 1948"
...... It is also stated that the younger Mr. Astbury erected part of the premises now the property of Mr. S. Ginders." ".... another occupied by – GINDER & Co., and the China Manufactory of GREEN and RICHARDS are also seated at Middle-Fenton." “The pottery in Market Street (now King Street), later known as the Victoria Works, was occupied from 1796 by Miles Mason and George Wolfe as the tenants of the Revd. John Wolfe. Mason had become a prosperous china and glass merchant in Fenchurch Street, London, in the early 1780's and began to make china at Liverpool in partnership with Thomas Wolfe of Stoke and John Lucock in 1796; the Fenton factory was used for the production of earthenware. Both partnerships were dissolved in 1800, and Mason then began to make porcelain on his own at the Victoria Works, moving in 1802 from Chigwell (Essex) to an 'excellent modern-built sash-window house' adjoining the works. The business evidently prospered, and in 1806 or 1807 he moved to the larger Minerva Works; the Victoria Works was then described as 'new erected'. It was held by Messrs. Ginder from 1807 and by Samuel Ginder and Company between at least 1811 and 1843. Messrs. Wathen and Lichfield held it by 1863, and from 1864 it was in the hands of James Bateman Wathen alone. In 1869 or 1870 he was followed by James Reeves, and a James Reeves was still working there in 1940. 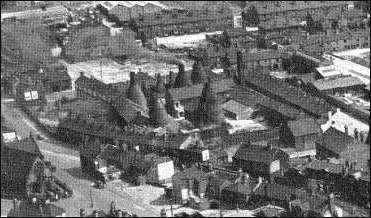 The works was held some ten years later by the Victoria Porcelain (Fenton) Company which still (1960) occupies it as part of the Victoria and Trentham Potteries.